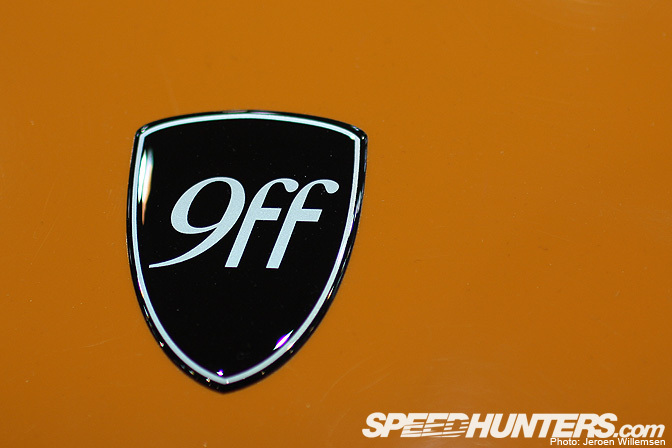 9ff unveiled this new version of the GT9 at the recent Essen Motor Show. It was specifically built for a customer that wanted a car that looked good and could hold its own on the track. 9ff dubbed the car CS or Club Sport. It’s based on the original GT9 that was unveiled at the 2007 Essen Motor Show. The GT9 CS is an evolution of the GT9 that was built for top speed runs. 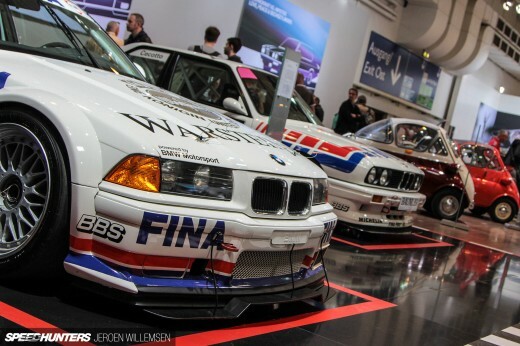 After the GT9 came the GT9-R that I featured last year during the My Car Show in Dortmund. This CS is the latest addition to their fleet. The GT9 cars are based on the 997 911 GT3 but there isn’t much left of the original car. Most of the body parts have been constructed using carbon fiber. The most impressive part of the car has to be the rear end with its massive diffuser and cut outs to ensure the best airflow. Here you can see how much wider the car has become. The Club Sport also got a newly designed spoiler. 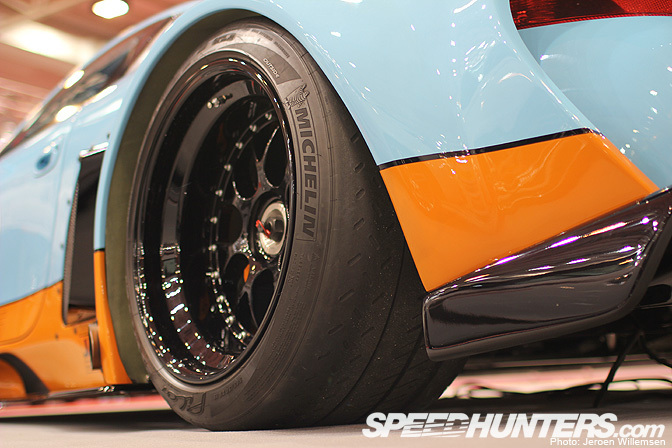 If I’m not mistaken these are BBS wheels, they come in 19″ with 345/30 Michelin Pilot Sport Cup tires wrapped around them. They fill the widened arches perfectly. While looking at the photo I noticed that yellowish color inside the wheel well. So I’m guessing they are made from fiber glass. Because the car has been made with a mid engine lay out 9ff had to think of additional cooling aids. Just in front of the rear wheels are these vents that house the radiators and an extra fan. Right beneath it are the exits for the titanium exhausts. The GT9 can be ordered with three different engine setups. It starts with Stage 1 that has 750bhp, Stage 2 with 987bhp and finally the Stage 3 engine with 1120bhp. Because it’s not always about horsepower the owner of the car decided to go with the Stage 1 engine. Too bad I don’t have any more info on the engine and its components. I really liked the widened arches, instead of just riveting them on they have been blended onto the body. This gave the car a very clean and subtle appearance. 9ff did make some small vents on top of the fender that were screwed in but it worked as a nice contrast. The interior still features the original dash but is has been flocked to reduce sun flare. They removed the center console to save some weight but they will tidy it up in the near future. You are strapped in by these cool 9ff belts. From this angle you can also see the new fire wall that 9ff made to separate the engine compartment. A visit to the 9ff workshop is long overdue. So for next year I’ll make sure that I visit them in Dortmund to have a closer look at their other cars and their workshop. I agree, you have to visit their workshop. Great article. Exceptional car, only thing I would change is the rear wing design to something more like the GT300 Subaru BRZ. Amazing looking car, i envy the owner very much!! It isn't the original dash. I'd say it's from the Boxster spyder. If that's true, then that's not a 997 911. 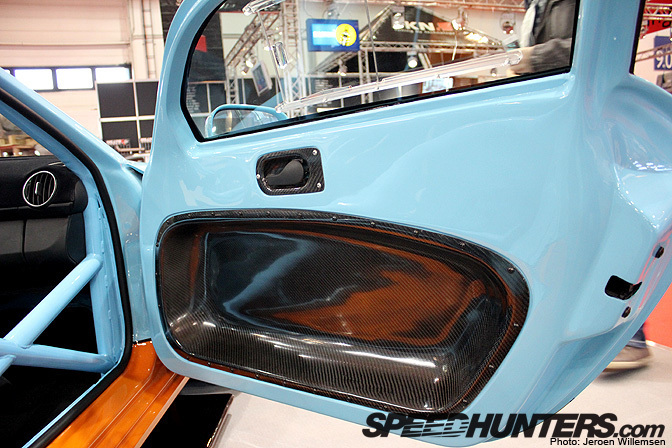 That dash is from a 987/987C Boxster or Cayman. 997s have rectangular vents. Tuned version of a race car? when will this be available for the streets? Auto? Kinda sad though im sure its still fast as all hell. liking what i see here..ticks all the box's.. what no video Roll?? The engine is 4.0 litre twin-turbo flat six, methinks. I agree about the spoiler. It looks a bit weedy, it needs to be much taller. You sure its a 997 GT3? Looks a LOT like a Cayman, which would fit with the mid-engine, rear arch scenario. Maybe a Gt3 engine in a Cayman? Will we see this car on any race series? Otherwise this car and its paint job are awesome !!! i want this car with a stage 3 engine tune in black and red. And i concur with everybody else that a visit to 9ff in dortmund is a good idea.